We hope you’ve been hard at work on your cars! If you would like the Scout Shop in LaGrange to cut your car for free, there’s still one more date left to do it: Saturday, January 19th from 9:30am to 2pm. They also have plenty of decals, weights and other Pinewood Derby items if you’re looking for inspiration. Here are all the race details. Please pay special attention to check-in times, as we can’t check in any cars outside of those times. Also, plan on pitching in on race day! Sign up for a parent volunteer spot today. Registration begins at 6PM and ends at 6:45PM. Voting is from 6:45-7pm. The race begins promptly at 7PM. Awards for the fastest car and best design will be awarded. We still have spots for parents to sign up! The cost is $20 per car and the proceeds go back directly to the Pack. This is a great way for parents to be involved in making a car with their Scout and generates a fun, friendly rivalry among parents. There were some amazing cars last year! If you want to participate, please email Mark Hill at mah101400@yahoo.com. This is always a fun event with some pretty amazing cars! Scouts who are checking in on Friday can test their cars on the track between 6 and 6:45. Remember: ONLY a Scout leader should touch the track or gate. We want to ensure everything stays intact for Saturday’s race. This year, there are two options to register your car. You can register on Friday between 6PM-6:45PM or on Saturday between 10AM-12PM. We can’t register any latecomers after registration closes or else we will not be able to begin our race on time. Here are the categories for voting: Most Scout Like, Coolest, Fastest Looking, Funniest & Most Creative. Be sure to arrive early so your Scout can test their car on the track between 10 and noon and make any final modifications. Your car will be weighed and limited tools will be available to help with modifications. Note that once your Scout’s car has been registered, only the leaders checking in cars and our volunteer Boy Scouts from Troop 24 will be handling the cars. This helps reduce the risk of mishaps. Lunch: The Girl Scouts are returning to run the lunch cafe in the Social Hall. They have a very reasonably priced menu with many tasty items such as pizza, sloppy joes, chicken noodle soup, etc. Be sure to visit them so your Scout doesn’t run out of fuel when it comes time for racing. The Derby begins at 1pm. Racing will be conducted by rank, so Lions are first followed by Wolves, Bears, Webelos I and Webelos II. The winners from each rank will take place in the Finals after all the ranks have completed their race. We hope to have all racing completed between 3&4pm. The race is a lot of fun and we invite you to bring the whole family to the Derby. 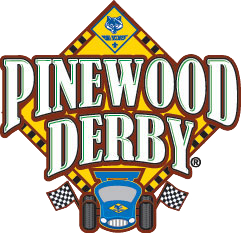 Please remember that Boy Scout Policy is that all parents must accompany their Scouts to these types of events, so if your Scout is going to participate in the derby, one parent must stay for the duration. We will have the movie room set up for their entertainment, but please feel free to bring other small, appropriate entertainment for your Scout (think cards, books, etc.). We need support from our Akelas to make the Derby successful! Please take a look at our SignUp Genius and see where you can volunteer. Do we have to stay for the whole Derby? The short answer is “No.” Be sure to check in between 10am & noon and then have your Scout on hand prior to the opening flag ceremony at 1pm. Check in should take you no more than 15 minutes, especially if you arrive prior to the absolute deadline of 12 noon. You are free to come & go, but remember at least one parent needs to be on hand while your scout participates in the derby. I don’t think I can check in by noon – can I please check in late? Absolutely not. Sorry, but the race officials will have to prepare the racing software based on the check in results, and also tabulate votes so racing can begin promptly at 1pm. If you do not check in on time, your Scout will not race. Ask a friend or neighbor to help you if you anticipate any issues. My car number has two of the same digits (i.e. 22 / 33 / 44) – what do I do? Be sure to use the number stickers from your pinewood kit on your scout’s car. Please bring along spare numbers to donate to the pit crew, so we have some extras for Scouts that have two of the same digit. What is the maximum weight? Five ounces as determined by the official scales at check-in. If your Scout’s car is in excess of the limit, you will have to remove weight. Pro tip #1 – don’t put weights on the bottom of your car… it can get caught on the track and ruin your Scout’s race. Pro tip #2 weigh your car at home and leave it a bit under five ounces, you can add a bit more weight in the pit crew area before you officially check in.